To get a feel for just how many plastic bags that actually is, picture this: if we tied 9 billion bags together, they would circle the earth 55 times (Greener Footprints). 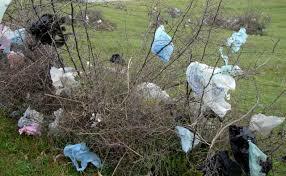 Every year it’s estimated between 500 billion and 1 trillion plastic bags are used across the globe. Although plastic bags weren’t widely used until the 1980s, their impact has already been felt around the world. A quick stroll through your neighbourhood can often reveal how pervasive plastic bags are when it comes to the problem of litter. Hanging from tree branches or tangled in hedges, plastic bags have become a depressing fixture in urban green spaces like parks, schoolyards, and sports fields. Such litter is not only unsightly; it can also contribute to major environmental issues. Large buildups of discarded plastic bags can clog drainage systems and contribute to major floods. Such flooding caused widespread destruction in Bangladesh in 1988 and 1998. Manila has also been vulnerable to flooding as a result of plastic-bag clogged sewers. In 2009, more than 80% of the Philippines’ capital was submerged. Hundreds were killed and thousands more were left homeless when entire neighbourhoods were swept away. Other aquatic chaos created by plastic bags has proven deadly to those who live in the water as well. Approximately 100,000 whales, seals, turtles and other marine animals are killed each year by plastic bags, which can strangle their victims or cause them to starve to death, according to Planet Ark, an international environmental group. A dead gray whale that washed ashore in Seattle in 2010 was found to have more than 20 plastic bags in its stomach. A 2012 University of British Columbia study found that 93 per cent of beached northern fulmars (migratory seabirds related to the albatross) had bellies full of plastic – a substantial increase from the last time they were tested, in 1980. In fact, plastic packaging is accumulating so quickly, it’s expected to outnumber fish in the sea by 2050, according to a recent report by the World Economic Forum. 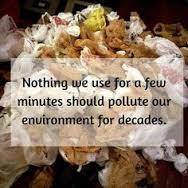 Most plastic bags are made from polyethylene and can take hundreds of years to decompose. 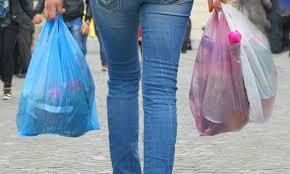 But steps are being taken to reduce the environmental footprint of plastic bags. 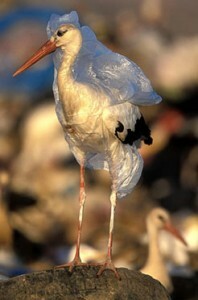 Use of plastic bags is either restricted or completely banned in over a quarter of the world’s countries. China, Italy, Bangladesh, South Africa, and parts of Australia have banned plastic bags outright, while municipal bans exist in parts of India, Mexico, Britain, the U.S., and Canada. Plastaxes – taxes on plastic bags paid by consumers – and new recycling laws have also been brought in to help address the issue. In February 2016, Walmart Canada began phasing out plastic shopping bags at Canadian Walmart stores. In place of these bags, customers will be offered discounted reusable bags for 25 cents. But plastic bags will still be offered for five cents in an effort to reduce the number of single-use bags they distribute. In my neck of the woods (Sidney, British Columbia), the grocery store I frequent doesn’t have plastic grocery bags but they do offer single-use brown paper bags – or, of course, you can use reusable grocery bags or a reusable cardboard box, specifically designed to hold the weight of groceries. 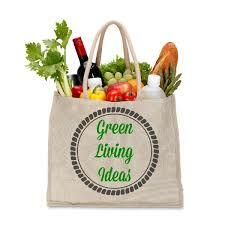 My personal preference is a box and several reusable bags. Although my community is supposedly very environmentally-friendly, I would have to say that, based on my personal observations, the majority of the grocery store customers still choose the single-use brown paper bag over the reusable bag and/or box. And I’m not sure why. Convenience, perhaps? Then again, for those of you who know me, I can be a bit psycho when it comes to using single-use shopping bags…plastic or otherwise! What about those little produce plastic bags? However, when it comes to bagging my fruits, veggies and bulk foods, I still find myself reaching for the small clear plastic bags off the roll-dispenser every time I go to the grocery store. So this is an area I’m going to work on improving: remembering to bring back to the store my plastic produce & bulk food baggies so I can reuse them a few times, instead of always getting new ones. A sturdy, reusable bag will last for years, and only needs to be used 5 times to have a lower environmental impact than a single-use bag. The solution to reducing plastic bag waste is literally in the bag: use less plastic bags in the first place. And, if you do have to use one, then be creative in getting multiple uses out of it. And when this isn’t an option, be sure to recycle it. And I think you are right that for many people, it takes money – a fee of some sort – for them to make a change in their habits.